Taco Bell, an Iron Chef, guerrilla gourmets, and Ruth Reichl do battle over the food world’s hottest new trend. Two weeks ago, the Culinary Institute of America held a three-day conference to celebrate what CIA president Tim Ryan called “food democracy,” which he defined as “an endless variety of great foods served quickly anywhere, anytime, at affordable prices to anyone.” For $1,095, here’s what you got—face time with Taco Bell execs and a reigning Iron Chef, a nearly limitless supply of Spanish wine and Singaporean pepper crabs, and a chance to see Ruth Reichl make top chefs cry. Some guerilla gourmets see the street food resurgence as a way to bring local, sustainable, and unfamiliar foods to a wider audience. But the scene is quickly getting crowded—and contentious. New York’s old-school vendors say they’re being pushed out by the upstarts. The newcomers complain that they’ve had their tires slashed and been threatened with sabotage or worse. Los Angeles restaurants have pushed for tighter regulations on taco trucks. And a food fight is heating up between the food-cart foodies and the restaurant chains and multinational companies that want in on the action. The tensions were on full display at the street food conference. At its “world marketplace,” tables were arrayed with samples of fine rioja wines, some of the world’s priciest restaurants served street-food-inspired hors d’oeuvres, and attendees munched on buttery slices of ham from the nation’s only legal source of black Iberian pigs. Most tables in the marketplace were funded by agribusiness or large companies. Unilever Foodsolutions sponsored a chef who was making empanadas de camarón with Hellmann’s Mayonnaise. Earlier in the day, I ran into a Trader Joe’s executive who was seeking ideas for the store’s frozen foods section. Street food’s biggest rock star is Roy Choi (left), who did a cooking demonstration before a packed audience that included PF Chang’s China Bistro founder Phillip Chiang and a representative from the food-service giant Sysco. Born in South Korea and raised in Los Angeles, Choi graduated from the CIA and became the executive chef at the Beverly Hilton. 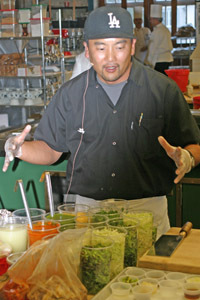 Last year, he lost his job at an Asian restaurant and on a whim started Kogi, a food truck that serves a hybrid of Mexican and Korean food. His Korean BBQ drenched in salsa, wrapped in a corn tortilla, and topped with kimchi was an instant hit. “All your joys in life come into that one bite,” he boasts of his $2 tacos. Choi’s four trucks now tweet their locations to nearly 50,000 followers and serve 5,000 people a day. 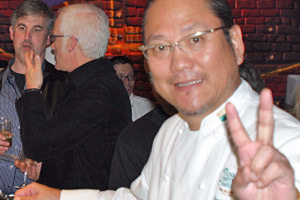 While Choi was assembling his tacos, chefs from Zanzibar and Brazil demonstrated “casual flavors for American menus,” current Iron Chef Masaharu Morimoto (right) was making Japanese street food, and former Chez Panisse chef Joyce Goldstein was moderating an event called “World Live Fire,” where a sword-wielding Turkish chef prepared lamb-liver kebabs. The idea of street food struck a romantic chord with some chefs at the conference. Rick Bayless, chef at Chicago’s Frontera Grill, described feeling “really conflicted” during a tour of Mexico City’s food stalls: “There seemed to be a lot more enthusiasm on the part of the chefs for the street food than for that incredible stuff that they were making for the fancy dinner that we had just served.” Suvir Saran, cofounder of Dévi, the only Indian restaurant in the country to earn a coveted Michelin star, insisted that the only place where he’d want to cook full time “is in a street cart.” The only thing stopping him, he claimed, was his business partner.